I had a rubber backed entry mat on a hardwood floor at my home It would slide around and I needed something to hold still at all times in the exact location I wanted it. So, years ago I had used double stick tape which made quite a mess on the floor. But I got a new mat last week and I wanted something that would do the same job but not damage the floor. 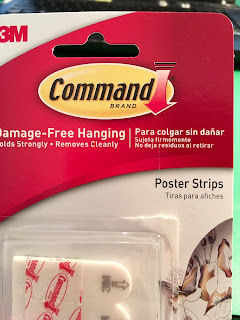 After researching a lot of products I decided to give command strips a try. But I needed very thin ones not the usual thick ones. 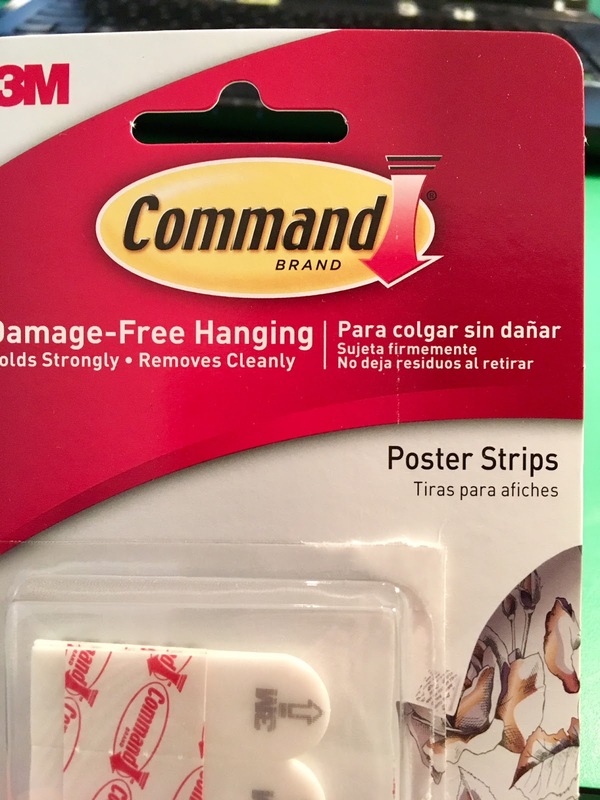 I discovered the poster strips (see photo) at the target store on sale for about $3.50. So far they have worked perfect. The rug is now secure and does not slide around and command strips will leave no residue on the floor when it eventually has to be replaced. They also appear to be excellent for putting posters on the wall without damaging the wall paint. I would imagine they’re holding power is not great but for many things you put on the wall you really don’t need a lot of holding power. I’m thinking of using these at the bottom of artwork that is suspended on the usual wire over a hook. Overtime these pictures get crooked. I think these tabs put on the bottom of the picture would hold it to the wall in the correct position without damaging anything. There are quite a few strips in a single package as well. So the net result is fairly inexpensive. https://nuwber.com a new website to find people, their ages, addresses and phone numbers. Finding a phone number on line is always a bit of a struggle. So many people have dropped their land lines, and thus the White Pages websites are not as useful as they used to be. I have used www.whitepages.com for years, and a few others, but most of them now require disclosures of who you are (I won’t give that) and or a monthly fee to find all the research they claim to have done and can show you. For a fee, of course. So, I was happy to discover https://nuwber.com it seems to give most of the information I need but without memberships or fees or come-on propositions. For finding out who called me, I use not only the reverse lookup for www.whitepages.com but also https://whocallsme.com which logs in from volunteers many of the telemarketing calls (spam calls). Very few of the callers I look up are “real”, 99% are spam/marketing calls. Watch this video --- you won't regret viewing it. This is valid, I have gotten some of these calls as have my friends, we never answer them but these criminals have gotten good at faking one of your “contacts” when they call, and if you answer, they could either try to sell you something, or worse, ask for personal information since they need it for an emergency, or to qualify you for a free cruise or something. If I had not seen this on my own phone, I would not think it is a risk, but, I feel sure this is a risk. Choose a country, choose a year (time frame) and listen to high quality music from that Country and time frame. For an item costing only $10 or so, I have spent a lot of time researching my best solution for two or three locations (homes I own). And will probably buy both of these (links below, neither seems to be in Lowes, HD or WalMart) , since both have good features I will try both and decide on the best one to make primary. The yellow one would be good for lifting the heavy cover on the meter, using the slot – as opposed to the screwdriver I now use. And both will cut off gas lines in emergency, and I have nothing to do that at my home that has a gas line so I need to learn, and possibly this tool could make the job easer and safer? The second one is in two pieces, so it would hide away nicely near the meter (in one property) and isn’t obvious as to what it is. he yellow one would be outstandingly easy to find in an emergency, and could even hang on the garage and storage room wall, it is not unsightly. So many companies we all use today are difficult to reach by phone (cable plans, telecoms, cell phones and so forth) This website might help us get to a "human" faster. To get a human on the phone, you put in the name of the company you are trying to reach. And it suggests phone numbers supplied by either the company employees or other users like yourself. 2. the time “right now” to get a human, often less than average, but sometimes more than average… how do they know this exact time? I don’t know. 3. sometimes they tell you the buttons to push on your phone to avoid the screening stuff of the automated answering systems. Sometimes it tells you to push 1, then 5, then 5 again, then some other combination of numbers. That yields you a quicker place in the que for a human. I found this website looking for something else. I was looking at Straight Talk mobile service, offered by Wal Mart, it is currently one of the cheapest unlimited 4-G data plus unlimited voice and text ($45 a month) … no contract required. You use their SIM card, and pre-pay or something. They sell high end phones cheap too, they were advertising an iPhone 6 for $129 on Black Friday, quite a low price. That would put you in the iPhone and cell phone business very cheaply. The Straight Talk folks say they have 99.5 % coverage in the USA they lease time on other networks, I think. Customer service, via telephone, is slow, but maybe better than some companies. month is generous. They claim “most” video you watch on your phone would be HD. I have used this for years, and have confidence in this as a good system for removing junk stuff from a PC to make it run better, and possibly eliminate some spying stuff (certain cookies). After years of enjoyment of this free software, they had a hack of some of their older versions. So, if you are running one of the versions below, please upgrade to 5.34.. it is free, I just did it for all my computers this morning. NOTE --- I also use MalwareBytes software for cleaning my computers of virus or potential useless, or harmful stuff. 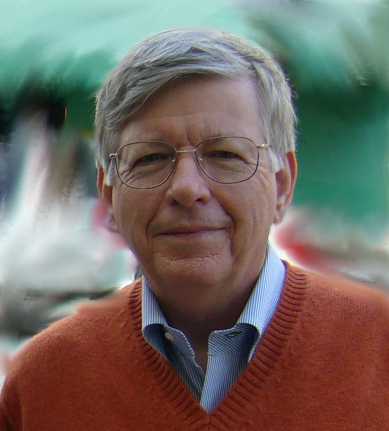 I have used this software for 8 years or more, and have confidence in it. One version of it is free. They have had 2 billion downloads, it is a serious computer accessory. How to install and run.